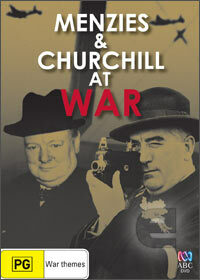 Menzies and Churchill at War is an impressive joint venture between Screen Australia, 360 Degree Films, Film Victoria and the ABC which uses the actual diaries of Robert Menzies and footage from the era in this dramatized documentary. The production also boasts a star studded cast that include Matthew King as Robert Menzies, Charles 'Bud' Tingwell as the perfect Winston Churchill, Dennis Coard as Fred Shedden, Margot Knight as Pattie Menzies, Chris Waters as Lord Beaverbrook, Ian McTear as Archibald Sinclair and Richard Askin as Colin Bednall, an Australian journalist. This dramatized documentary also adds one of England's and Australia's most controversial theories between the two leaders where Menzies was about to overthrow Churchill who was apparently an alarmist at how the war was going. Ironically, this attempt by Menzies cost his his prime ministership, however it also led Australia into a new world of politics and prosperity. The documentary features some engaging interviews of Australia's top academics, including Heather Henderson, Robert Menzies daughter. A thrilling look at our past that is a must have for anyone interested in Australian history. Charles 'Bud' Tingwell is brilliant as the rotund Churchill as are the other actors involved in this gripping dramatisation of a world on the edge.